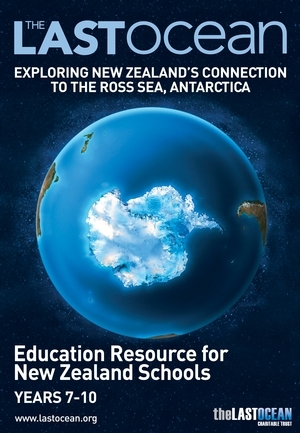 This resource has been designed for teachers at New Zealand schools targeting Years 7 – 10, and can be adapted for other age groups where students are invited to explore with the Inquiry method. Based on the Last Ocean Charitable Trust website, the package includes the DVD of the documentary The Last Ocean and access to an online e-Book which may be downloaded as a PDF for printing. The 90-page illustrated resource contains an introductory section plus seven chapters with comprehensive Teacher Guidelines, Literacy Lesson Texts with Instructions and Student Worksheets, as well as an Additional Activities and Information section. The resource has a strong online component with embedded links to websites and relevant YouTube videos. For those who prefer a hard copy, the resource may be purchased as a full-colour printed booklet at an additional cost of $75. *To download the PDF to your computer, right click and select "Download linked file as" and save it to a suitable location on your computer. To purchase the full Education Package, visit our online store. Please note: New Zealand sales only. Tax invoices can be provided to schools upon request, please email info@lastocean.co.nz.